This weekend box office results this Warren’s Bro Aqua Man number one in box-office weekend results make over 67 million .both Mary Poppins return and bumblebee movie running up neck to neck in box office. Last night went special advance screenings Warren Bro’s Aqua Man new movie from in the DCEU starting Jason Momoa Amber Heard Patrick Wilson’s Nicole Kidman Yahya Abdul-Mateen II William Defoe Dolph Lundgen director bye James Wan . Aquaman and it was amazing , this wasn’t your typical dark and moody DC film but it was a great origin superhero story. It’s fun and badass all at the same time. The DCEU is headed in the right direction, by being true to their characters. Think see better flims from dceu next coming years like said right director in movies . This amazing movie is lot money opening weekend Abbot week half reel enjoy world in Atlantis visionary totally awesome and amazing the villians was great black Manta and ocean master fighting with Aqua Man amazing and intense well done . Like said the DCEU is heading right direction see more great flims next come years . I give Aqua Man five bowls of guacamoles totally amazing . This movie review Warren Bro’s Aqua Man starting Jason Momoa Amber Heard Patrick Wilson’s Nicole Kidman Yahya Abdul-Mateen II William Defoe Dolph Lundgen director bye James Wan . Patrick Wilson is today cast in James Wan Warren Bros Aqua Man . Report deadline. Com Patrick Wilson cast in aqua man movie he playing comic book ask Orm evil half brother aqua man also ask ocean master . Patrick Wilson good choice playing ocean master he no stranger playing in comic book movie in Zack Snyder Watch Man think good pick for that character . ​Michael Jai White Wants To Play Black manta in aquaman Movie there story going around that black manta main villain for aqua man movie not official from warren bro is black manta is main villian in movie aqua man. When official from Warren Bros black manta in aqua man Michael Jai White one top candidate playing character also like Idris Elba playing black manta in movie. Mine two candidate Michael Jai White and Idris Elris playing black manta in aqua man movie Michael Jai White want the role think can able doing role for pretty good choice for character for movie. 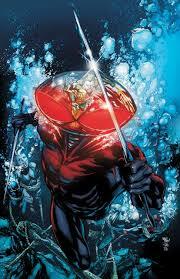 But hope Warren Bros contact get Idris Elris playing black manta in aqua man movie . Because he be great choice the role black manta his voice very strong spoke he great playing villian he playing voice Shar Kahn disney jungle book also was he villian star trek beyond Idris Elris perfect choice for black manta in aqua man movie . Well found soon black manta in movie who playing role Warren Bros make announced pretty soon Aquaman movie release 2018 .